Before CFUN and CKLG, there was CKWX. The Vancouver outlet was the first station in Canada's third-largest metropolitan area to adopt a full-time Top 40 format. CKWX's initial "Sensational Sixty" chart appeared in 1958, the year after Red Robinson arrived for the first of his three stints at the station. An early lineup from September, 1958 shows Robinson along with Bill Davis, Norris McLean, Cal George, Bob McGavin and Ross Crain. Robinson actually did a split shift - common for the era - appearing from 3:05 to 5 p.m. and again from 10:20 p.m. to midnight. Many jocks came and went at CKWX before the station began phasing out Top 40 around the fall of 1961. Jim Robson, later the Voice of the Vancouver Canucks, did mornings for a time. There was Buddy Clyde with his "squeeze horn." Keith Rich and Steve Woodman did mornings before moving to WNBC New York. Other CKWX air personalities during the Top 40 era included Jim Waddell, Norm Grohman, Barrie Clark, Nick Sands, Andy Laughland, Ray Willes and Del Erickson. By 1962, the latest vestige of CKWX's Top 40 format was Robinson's "Platter Party" show, heard weeknights 7 p.m.-midnight. 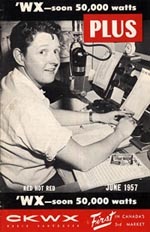 When Robinson signed off for final time on March 16, 1962 so did CKWX's short but groundbreaking life as a Top 40 station. Robinson went to CFUN, which had morphed into a Top 40 station by the summer of 1960. CKLG joined Vancouver's Top 40 wars in August, 1964. But we should never forget CKWX, the station that started it all for Top 40 fans in Vancouver. Enjoy Red Robinson on CKWX here.